This July 4th, after months of refurbishment to make major changes to the show, the Magic Kingdom's Hall of Presidents will re-open. The Hall of Presidents is one of the Magic Kingdom's original attractions, debuting on opening day October 1st, 1971. George Washington will now have a speaking role during the show. Abraham Lincoln now will recite the entire Gettysburg Address. President Barack Obama is now represented and will have a speaking role. 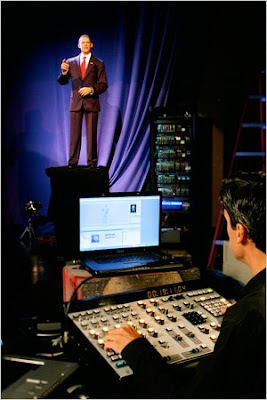 The Audio Animatronic figure of our 44th President, Barack Obama, is one of the most lifelike ever created. The President participated in the process by giving his measurements to the Disney Staff of Imagineers, as well as, recording the recreation of his taking the Oath of Office and a brief speech prepared specifically for this attraction. "The Obama figure is the result of attention to minute details by Disney sculptors, animators, engineers and even anatomists who pored over presidential photographs and video of him and then drew on the latest advances in robotic technology. Thus the audio-animatronic Obama even purses its lips to pronounce its b’s and p’s in a way frighteningly evocative of the real one, and raises its hands, open-palmed, while shrugging its shoulders, in a way that can only be described as Obamaesque. " Although Presidents Bill Clinton and George W. Bush had Audio Animatronic figures created based upon their measurements and their voices recorded for speaking roles during their tenures, the Obama figure promises to be the most lifelike yet. Expect large crowds this summer after it opens as people clamor to see the changes to the attraction and show support for the very popular new President. 0 comments to "Disney World's Hall of Presidents Re-Opens July 4th With New Show And President Barack Obama"